The Economic Times' survey today rated Pune as the #1 city in western India to live and work (Mumbai is #2). As per today's ET, the city tops the list in the earnings category (ie., per capita income, job opportunities, employment growth), as an investment destination, and is the 2nd most favored place to live in. The survey underlines what we (who live here) already knew! This city with a population of 5.13 million is now one of the fastest growing cities in the country. Of the 100,000 people coming into the city every year, about 30% join the manufacturing sector, while 60% enter new-economy industries (IT, biotech, etc.). Update, Oct 2008: Pune will soon acquire the status of being a metropolitan city in India. According to an Assocham report on ‘The 7th emerging metro city in India’ it owes its upgradation to a fast development pace in the area of infrastructural facilities, friendly business environment, education avenues and employment opportunities. The report says Pune has a literacy rate of 80.73%, 26 malls & multiplexes, and 17 star category hotels. 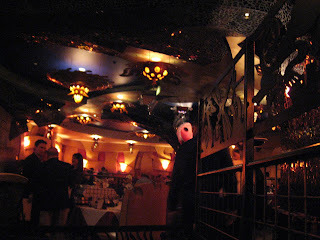 Dinner at Americas in Houston, my second time here. The day was unusually windy and chilly, and since I was staying at the Hilton Post Oak, the only place I dared venture out for dinner was this restaurant right across the street. The entire block here is being reconstructed and only Hermes of Paris and Americas are open in this block. 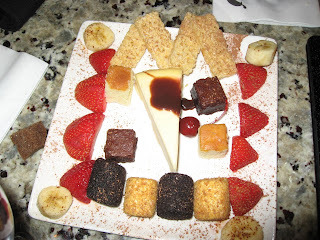 Americas is the place to go for fine South American dining. The place has a funky interior, very unlike Churrascos which I had reviewed in my previous visit to this city, and which shares the same owners! 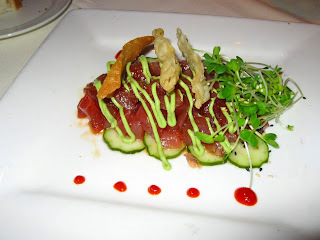 I ordered a glass of La Crema Sonoma Coast Pinot Noir with my starter, a Peruvian style Ceviche that contained sushi grade seafood served in a carved pineapple. The ceviche was very fresh and tangy and went very well with the wine. 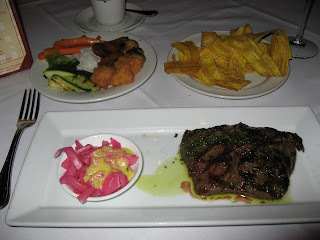 I ordered Churrasco for my entree, an 8 oz medium-rare beef tenderloin; the meat was most tender and flavorful. 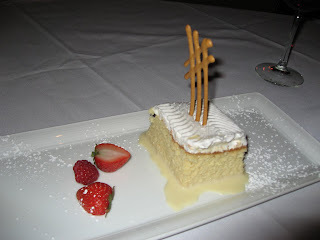 I ended my dinner with the The Original Tres Leches, a cake soaked in three kinds of milk. So moist, so wonderful! 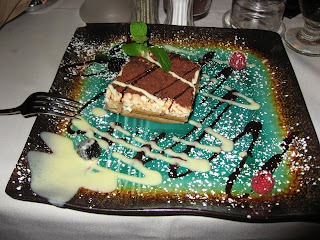 I highly recommend you try this dessert at least once. 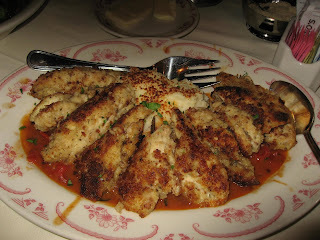 If there is one thing you should eat here, it has to be the catfish amok. 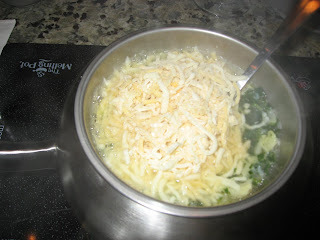 Absolutely fabulous and unlike anything I have eaten before. 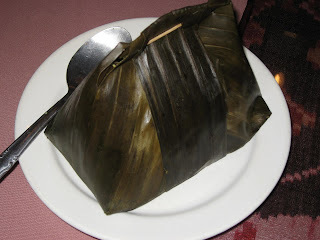 This dish is a kind of fish loaf steamed in a banana leaf with curried lemongrass and coconut milk and served piping hot. 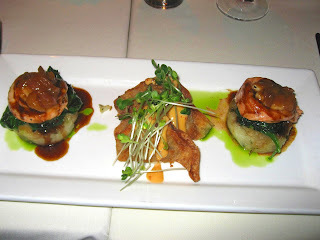 I loved the taste, texture and flavors: catfish has never tasted this nice! Before the Amok we had started with Tom Yum soup which was sort of like the Thai version, but contained a lot of veggies, especially baby-corn. 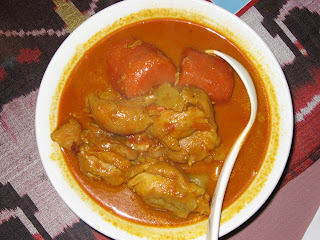 We also ordered the Samlaw Curry Moin, a chicken stew with carrots, potatoes, coconut milk and curry spices. This was good too, spicy but also a little sweet from the carrots. 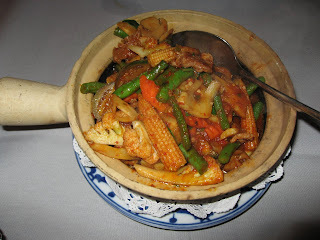 And finally we ordered the Cha Me Kathang, flat rice noodles stir fried with mixed veggies and meat. 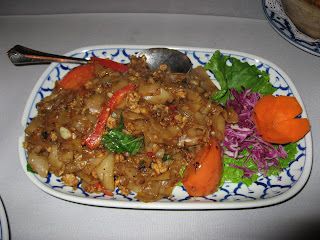 Quite similar to the drunken noodles we ordered at Krungthai the other day. 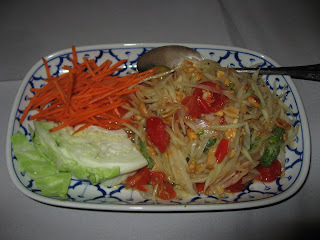 Again, milder in spice to the Thai version. 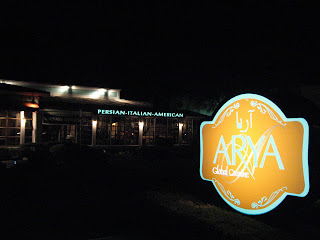 Great food, nice atmosphere, completely off the beaten path and great value for money! 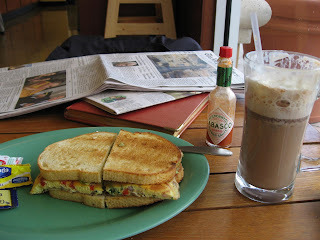 Portions were quite large and the prices modest. I know I am coming back for that Amok again. 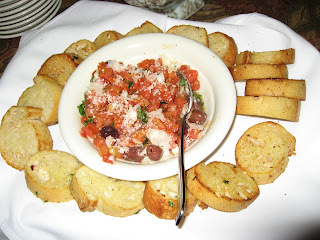 Yesterday, a friend and I drove down to Picasso's restaurant for a taste of Spain. 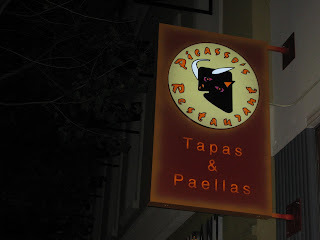 This small eatery in downtown San Jose specializes in Tapas and Paellas. Being a Saturday night the restaurant was packed and we were lucky to get our table almost immediately. The walls, no surprise, are decorated with prints of Spain's most famous cubist painter whose name adorns the restaurant. Like everyone else in the restaurant we ordered Sangria for drinks. Sangría is a wine punch from Spain. The word sangría comes from the Spanish sangre meaning blood. It typically consists of red wine, chopped fruit (in our case, apple), a sweetener such as honey or orange juice, a small amount of added brandy, triple-sec or soda. Interestingly, the locals will never order Sangria in a bar; it is something you will only serve in house parties. So, bar sangria in Spain is aimed almost exclusively at tourists. We ordered some small plates from the Tapas menu. 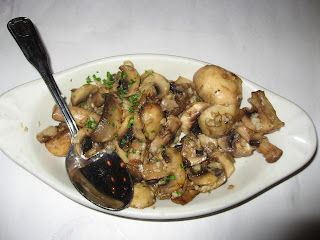 The Salteado de Champinones y Setas was an assortment of sauteed mushrooms featuring button, shitake and portabello mushrooms flambed in garlic and paprika with Spanish dry sherry. 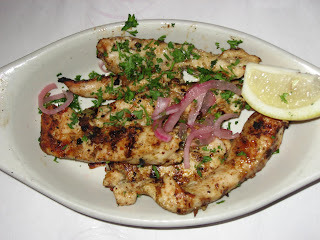 The Pinchitos Morunos de cerdo was a spicy dish of marinated chicken fillet. 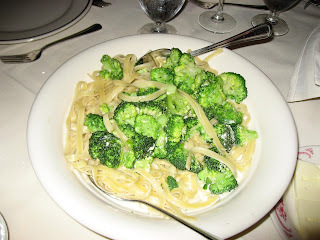 While the dishes took way too long to arrive, when they did, they were well worth the wait. We ordered the Paella a la Valenciana for our entree. 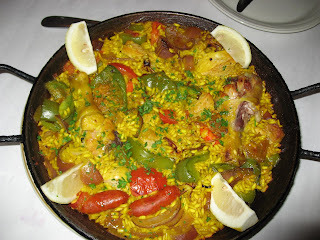 This is traditional paella featuring chicken, calamari, chorizo, mussels, shrimps and saffron rice. Please note that you can order Paella for a minimum of two people and it takes about 20-25 minutes to prepare. The paella was interesting, sort of like a Spanish version of the Indian biryani but made with parboiled rice. The verdict? The food is great but the service was extremely poor on the day I was here, with long wait times and an indifferent waiter. For the kind of restaurant this is, the prices are also a bit on the higher side. 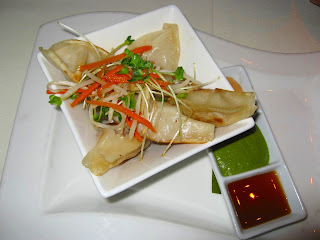 At The Maratha, Mumbai, I decide to try the highly regarded Pan Asian this time. 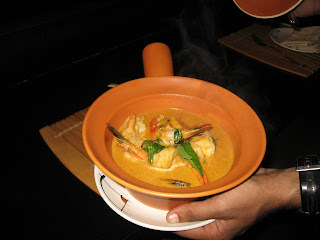 I have earlier posted about Dakshin and Dum Pukht, two other gourmet restaurants in this hotel. Pan Asian turns out to be an excellent choice. The massive display kitchens makes for a lively dinner experience, especially for those dining alone (like I am tonight). 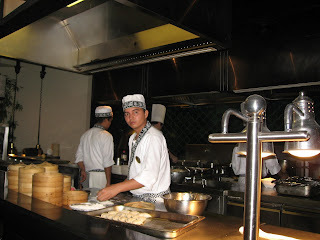 The kitchens showcase delectible cuisines from China, Thailand, Mongolia, Korea and Japan. 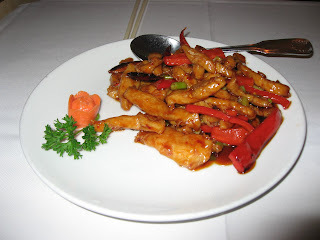 This premier upscale restaurant owes its success to two striking factors, the décor and the authentic cuisine of Chinese Chef Liang. The restaurant also serves a variety of sushi and sashimi. I choose the steamed Prawn Dumplings followed by Prawn Thai Curry. Both are superb! Very fresh prawns can make a world of difference. The dim-sums are delicious, as is the the Thai curry: a perfect blend of coconut milk, spices, bell peppers, pineapple chunks and large prawns with steamed rice. Today am I pairing the food with a glass of Grover's Cabernet Shiraz. Dessert consisting of Vanilla Bean ice-cream with Cantonese crisp stuffed coconut pancake makes for a memorable grand finale to a great dining experience. 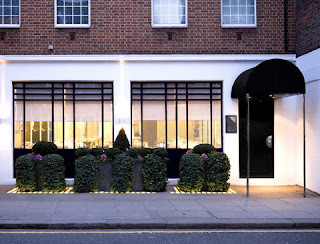 It probably won't surprise anyone that London is now the most expensive city to dine in. As per Zagat Survey, the average price of an evening meal in a Zagat rated restaurant is $78 per person. Tokyo and Paris follow close behind with $73 and $ 72 respectively. BusinessWeek provides more details. Here's a picture of Gordon Ramsey in London. Their $224 seven-course dinner is the most expensive meal in town—and that's without drinks and the 12.5% gratuity. 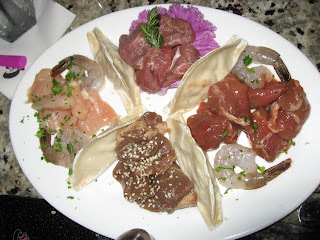 Samplings include roasted foie gras with white asparagus, pan-fried scallops with octopus and parmesan sauce, and roasted duck breast with rutabaga and honey. The restaurant's celebrity chef has been awarded 10 Michelin stars so far and some of you may have seen him on TV hosting Hell's Kitchen or Kitchen Nightmares on FOX. 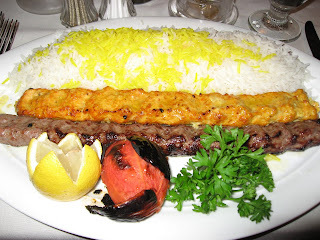 For other pricey meals in restaurants across the globe, click here. 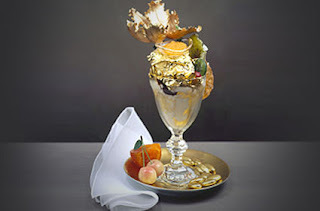 And here's a look at The Golden Opulence Sundae, the world's most expensive at $1000 per serving, at the Serendipity, New York City. Scoops of Tahitian vanilla bean ice cream infused with smoky Madagascar vanilla are coated in 23-carat edible gold leaf, which leaves a ring of gold dust around people’s mouths. Suffused with bittersweet chocolate and rare chocolate chunks, gold-plated dragets and truffles, the sundae is eaten with an 18k gold spoon and a mother-of-pearl spoon is reserved for the mini-bowl of sweetened, de-salted caviar on top. The utensils stay at the restaurant, but the Baccarat crystal goblet is yours for the taking. 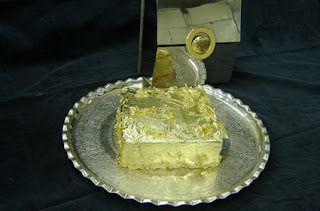 Finally, the $1000 Sultan's Golden Cake at the Ciragan Palace Kempinski at Instanbul. It takes 72 hours to make this edible brick of gold, available by special request. Spiked with apricots, pears, quince and figs that have been marinating in Jamaican rum for two years, and flavored with shaved caramelized black truffles, this 24-carat gold leaf-covered cake is presented in a sterling silver handcrafted cake box with a golden seal. 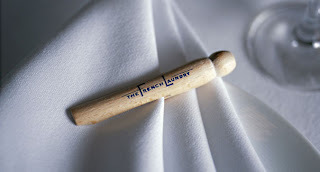 If you have still have any more money left to pamper your taste-buds, click here for other options. That I have a sweet tooth doesn’t surprise anyone in India. 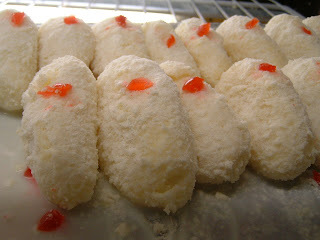 Bengal is known for its wide variety of sweets and Bengali meals are incomplete without desserts. 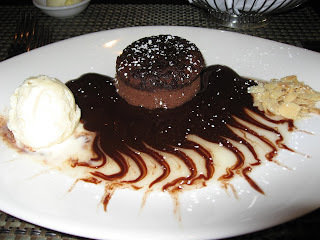 I never ever pass up an opportunity to try the desserts during dinner, especially when I am visiting a new place. Desserts have history. There is evidence of English sweet puddings during the 17th century made of flour, nuts and sugar. Food historians generally agree that custard, the sweet almost pudding-like substance we know today, dates to the Middle Ages. At that time custard was eaten alone or used as fillings for pies, tarts, pastry, etc. Flan -- an open tart filled with fruit, a cream, or a mixture -- was probably the most famous and widely adapted custard dessert in the world. It is important to note that custard was not unique to Europe. 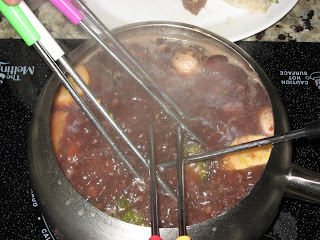 Similar recipes flourished in Asia. 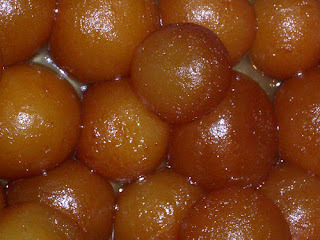 Note: Gulab Jamun picture by EliBlue and Gajar Halwa picture by Esherman. 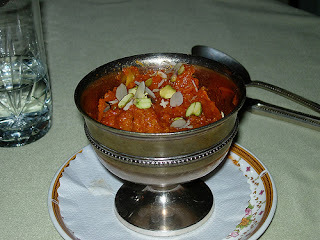 Among Indian desserts, there is evidence of Halwa in the 7th century. Halwa is derived from the Arabic word hulw which means sweet. In 7th century Arabia, the word meant a paste of dates kneaded with milk. By the 9th century, it had acquired a meaning of wheat flour or semolina, cooked by frying or toasting and worked into a stiff paste with a sweetening agent such as sugar syrup, date syrup, grape syrup, or honey by stirring the mass together over a gentle heat. Usually a flavoring was added such as nuts, rosewater, or pureed cooked carrots (still a popular flavoring). The finished sweetmeat would be cut into bars or molded into fanciful shapes. Halva spread both eastwards and westwards, with the result that is is made with a wide variety of ingredients, methods, and flavorings. Note: From Oxford Companion to Food, Alan Davidson [Oxford University Press 1999 (p. 367). Also: Rasmalai picture by Debra. Sweet shops in India have a far greater variety of sweet offerings on display than bakeries in the West. 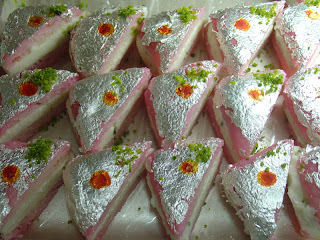 Many small towns and cities are known primarily for their sweets (Mithai in Hindi). Agra, home to the Taj Mahal, is also known for its Pethas, a unique sweet made from winter melon. 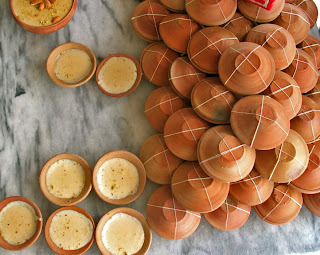 Burdwan, in West Bengal, is known for its Mihidana which is rarely found outside this region and the famous Roshogollas of West Bengal are best tasted in the Oriya town of Pahala. The list goes on. Unlike western desserts which are usually chocolate, whipped cream, or fruit-based, most Indian sweets are made of thickened milk, fresh curd cheese, or are flour-based. 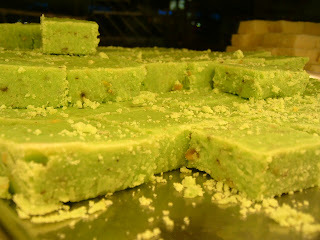 It’s difficult to provide a list of Indian desserts that is even close to being comprehensive. 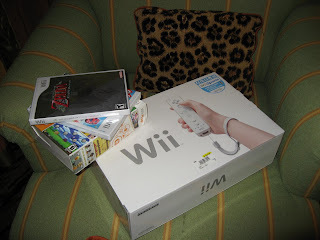 Even describing my personal favorites is difficult in a single post. Kheer is an all time favorite. 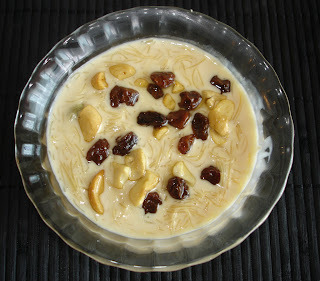 This creamy pudding is made in a wide variety of ways, with rice, with semolina, or just thickened milk sprinkled with chopped dry fruits. 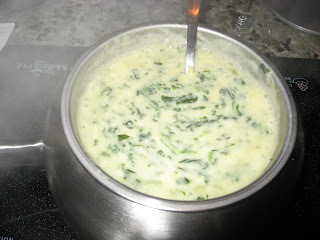 My mother always made this dish at home on my birthdays during childhood and that tradition still continues. Note: Kheer picture by Warina and Phirni picture by lecercle. Phirni is a variation of the kheer, brought into India by the Mughals, and is a popular dessert after a meal of biryanis and kababs. Made of powdered rice and thickened milk, Phirni is usually chilled in small earthen pots and directly served in them. Next are the Gulab Jamuns, those delicious soft balls of fried milk solids immersed in sugar syrup and flavored with cardamom, saffron, or rose. In the olden days, Gulab Jamun was made with ‘bhatti khoya’, milk solids that were aged to six months producing a hard, aromatic khoya that was then grated, bound with maida (flour) into balls before being deep-fried and immersed in sugar syrup. Bengali sweets are mostly made of chhena, ripened fresh curd cheese which means they have to be eaten within a day or two of preparation. A wide variety of delights include the Roshogolla, Shondesh, Chomchom, and the Pantua. Note: Pictures of Bengali sweets above by Danburg Murmur and Debra. 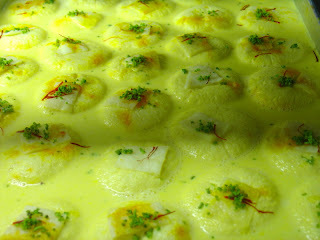 Rasmalai is another favorite, especially with those who are new to Indian sweets. Mildly sweet, these dumplings are made from cottage or ricotta cheese in thickened milk, delicately flavored with cardamoms and topped with crushed pistachios. 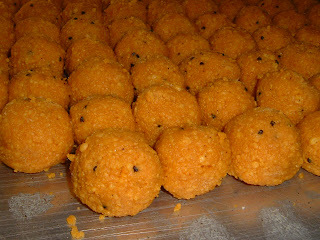 Then there are the large variety of Laddoos and Burfis. 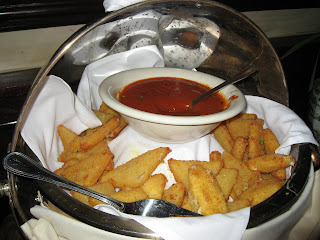 Made of a variety of different ingredients, these come in various flavors, colors and sizes. I especially love Motichur laddoos, commonly used as religious offerings in Indian festivals, and Kaju Barfis made from cashewnut paste and available in a wide variety of variations. 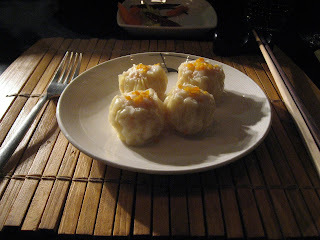 Note: Pictures of laddoos and burfis by Danburg Murmur. And finally, a dessert from Western India where I now live: the Shrikhand. The Shrikhand is a creamy dessert made out of strained yogurt, from which all water is drained off, leaving the thick yogurt cream by itself. Adding exotic dry fruits like mangos only enhances the Shrikhand’s delightful taste to newer limits.